16 I pray that out of his glorious riches he may strengthen you with power through his Spirit in your inner being, 17 so that Christ may dwell in your hearts through faith. And I pray that you, being rooted and established in love, 18 may have power, together with all the Lord’s holy people, to grasp how wide and long and high and deep is the love of Christ, 19 and to know this love that surpasses knowledge — that you may be filled to the measure of all the fullness of God. 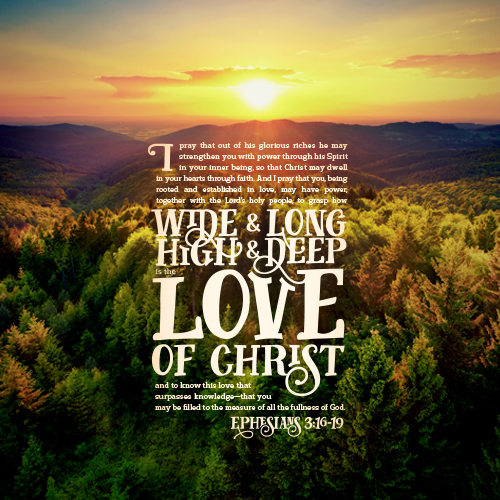 In this prayer, Paul asks God to strengthen the hearts (“your inner being”) of the Ephesian believers with power through his Spirit so that two things might happen: One, that Christ may dwell in their hearts through faith; and two, that they might grasp and know the love of Christ. These two requests sound ordinary but they are anything but that. I’ve already discussed is a previous article what the apostle meant when he prayed for Christ to “dwell in your hearts through faith” and so in this article I will focus on his second extraordinary request. So why does Paul pray that God empower the Ephesian believers to comprehend and know the love of Christ? Well, we pray for God’s power to intervene in peoples’ lives when their lives are beyond the help of human assistance. We do the same for ourselves. We turn to God for his help (his power) when we cannot be or do what we long to be or do. For instance, I turn to the Lord for his power when I am exhausted and can easily become irritated with family members. I desire to be gentle in speech and patient in heart and so I continually turn to Jesus for his grace (his power) to strengthen me in my weariness. So Paul prays this prayer because the Ephesian believers and we cannot grasp and know the love of Christ without His enabling power. But why can’t we comprehend and know Christ’s love on our own? You can probably think of a variety of reasons but I’ll just share one. I think the main reason we cannot understand and fully embrace the love of Christ on our own is because the source of our love is not the same. Jesus’ love for others flowed out of a life that was completely abandoned to the Father’s immeasurable favor and love for him (John 5:19-20, 30). While our love flows out of a life that’s dependent on the favor and love of others (John 5:41-42). Basically, we love those who give us something in return. It might be friendship, a favor, pleasure, respect, gratitude, money or just a smile but we are always looking for something in return from the person we have “loved”. You might think, “No, I love people regardless of how they respond to me.” Well, that may be sort of true for those you engage with sporadically throughout the year or just once, but what about those you interact with on a daily basis? What about your spouse to whom you vowed to love until “death do you part”? What about your sibling, relative, in-laws or even child? I have found that when a person who is “loved” by me no longer gives me something in return (whatever that might be), then my “love” for them withers. It grows cold and even mean. It’s within these daily relationships that I have found Jesus’ love to be completely different than mine. His forgiveness, patience and kindness are not dependent on the love-ability of the person. His faithful love continually engages and forgives. It speaks truth and yet humbly does not coerce or threaten. It bears all things, believes all things, hopes all things and endures all things. However, my love has a limit. And it’s when I’m at my limit that Paul’s prayer becomes my prayer. Oh Lord God, grant me the strength by the power of your Spirit in me to comprehend your unending love. Empower me to experience it and freely give it as you have freely given your love to me. Enable me to love like you even when it surpasses my knowledge and make no sense to me. Fill me with your love so that the fullness of your image be restored in me. Amen.